Through the generosity of William F. Thiel, a trust was established to address health care needs in Wyoming County. Seed money from the Thiel Trust has evolved into a comfortable and restful fourteen-bed Hospitality House. The Hospitality House is located above and behind the hospital. The Thiel House is handicapped accessible but does not provide patient care. 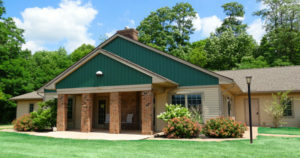 Individuals or families facing a health care crisis, on-call or visiting medical professionals and others may stay at Thiel House. In addition, half the house is committed for use by health professions and medical students willing to do a rural rotation in our county. It is our hope that their experience will lead some of them to choose Wyoming County or other local rural community as their future home, ensuring that the necessary mix of health professionals is available in rural communities. Health profession students serving a rural rotation at WCCH or another nearby preceptorship. Health Professionals providing services at WCCH (on-call, visiting phyiscians) needing temporary housing. Family of loved ones in crisis at WCCH or another facility. Other healthcare related community members and professionals. Complimentary wifi service in all bedrooms and common areas. Digital HD Televisions with over 75 channels. If you would like to stay at the Thiel Hospitality House, contact us for room availability and rates per night/week. To make arrangements, call R-AHEC staff at 585-786-6275.